Can you confirm these amateur observations of Chilabothrus chrysogaster? chrysogaster: Turks and Caicos Is. Type locality: "Turk's Island," perhaps meaning Grand Turk Island, Turks Islands, although the species has not been reported or collected there subsequently. relicquus: Bahama Is. : Great Inagua and Sheep Cay. Type locality: Sheep Cay off the northwest coast of Great Inagua Island, Bahama Islands. Subspecies: Chilabothrus chrysogaster schwartzi (BUDEN 1975) has been elevated to full species status. Tolson & Henderson,R.W. 1993. 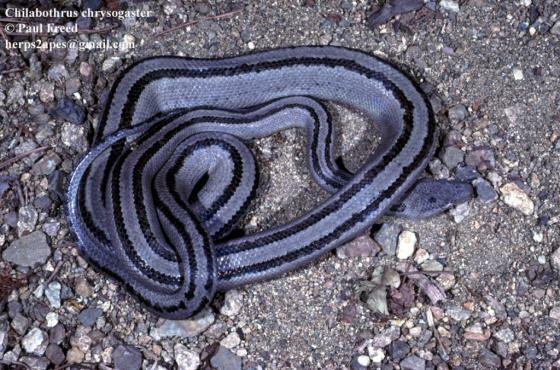 The natural history of West Indian Boas. R & A Publishing Ltd., Somerset, England.